and using, creating, and assigning Wixie activities. If you are training teachers who have already used Wixie in their classrooms, work with them to build skills and instructional expertise and develop curriculum materials to share with other educators in your school or district. Have participants brainstorm a topic or standard that their students struggled with this year. Look back at what you have taught in the past and search both the Wixie curriculum library and the Web for ideas from other educators. Then, work to develop a Wixie activity from scratch or customize an existing activity for formative purposes, content knowledge building, or performance assessment. Project Information - adjust the title, description, grade levels, and connected standards. Page content - change background and object features. 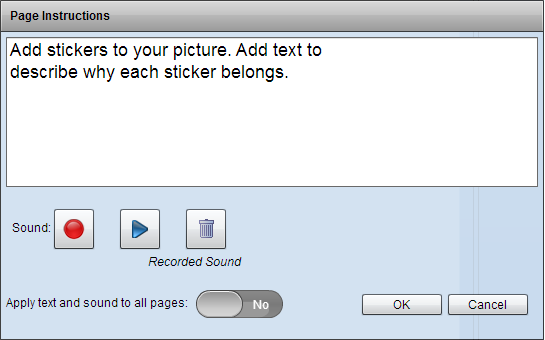 Instructions - edit the text and record voice instructions. You can find a more detailed set of steps in: Creating Wixie activities and templates from scratch. Spend some time learning and applying best practices for designing Wixie activities in the template or assignment they create. Be sure to show them how to turn off scaling handles, lock objects, and setting a default media library or panel. While a single activity may be useful to assign as a pre-assessment for formative purposes, our classrooms are filled with unique learners and a single activity isn't likely to be useful for all of them. Go to the Wixie teacher dashboard and click the Projects tab on the toolbar. It will show the contents of the My Projects folder. Have participants select a single activity they have already designed. Show them how to use the Actions button to Duplicate the activity. Then, have them edit each file to customize the content to better differentiate instruction for the unique learners in their classroom. For example, in this set of Kindergarten activities, there are three different activities where students match numbers to their number names. In the activity on the left, both numbers and names in are ordered sequentially. The activity in the middle mixes up the number names. The activity on the right mixes both number and number names. For older students, you might choose to include a timeline or number line for some students, while requiring others to draw the organizers and models themselves. After your teachers have created customized activities that match the needs of their learners to the learning goals of your school or district, its time to make them accessible to other teachers! In the area on the left, you will see your My Projects folder, a folder for your school, and if you have Wixie district-wide, a folder for your district. Click the icon for the project you want to share. Drag the icon on the folder, or sub-folder, where you want it to be shared. The project will be copied to this location and is now be available to every teacher to assign as an activity. *Note: Any teacher may share activities into a school folder. In order to share to a district folder, Wixie users must be set as a publisher. You may also want to spend some time before the workshop, or with participants in it, setting up folders and sub-folders within these directories. Many schools add folders for each grade level and then add sub-folders within these directories for each subject area, unit, or month. If you have developed a cadre of Wixie curriculum leaders, they are probably already experts, but you can share these resources to help them build capacity at their sites after the training. Have a great training. We can't wait to see what your teacher and students create with Wixie!